Prayers to our Lady ! LIST OF THE 62 CURES GIVING DATE, PLACE OF ORIGIN OF PATIENT, AND PATHOLOGY(last date in brackets indicates official recognition of miracle).First cures, taking place between 1860 and 1862 recorded by Mgr. Laurence’s commission.1.Louis BOURIETTE, of Lourdes (27-2-1858) (1862) Blindness due to trauma, right eye. (Quarryman, father of family). 2. Blaisette SOUPENE (married Cazenave), of Lourdes, (27-2-1858) (1862). Eye condition. Ectropion.3. Catherine LATAPIE-CHOUAT, of Loubajac. (1-3-1858) (1862). Paralysis of the right arm from stretching of the brachial plexus.4. Justin DUCONTE-BOUHORTS, called BOUHORTS, aged 2 years, of Lourdes. (1858) (1862). Paralysis of the legs due to tuberculosis.5. Henri BUSQUET, of Nay (28-4-1858) (1862). Scrofula. Typhic myositis of the sterno-mastoid. 6. Mrs. Madeleine RIZAN, widow, of Nay (17-10-1858) (1862). Perhaps a thalamic lesion (vomiting and dyspepsia). Generalized disorders following cholera. 7. Miss Marie MOREAU, of Tartas. (9-11-1858) (1862). Eye condition. Blindness in one eye, lacrimation and myopia. from 1862 to 1907 no canonical enquiry. 8. Miss Jeanne TULSANE, of Tours (8-9-1897) (27-10-1907). Lumbar Pott’s disease. 9. Miss Elise LESAGE, of Arras. (21-8-1892) (4-2-1908). Tuberculosis of the knee. 10. Sr. MAXIMILIEN, of Marseilles (20-5-1901) (5-2-1908). Hydatid cyst of the liver. Phlebitis of the left leg. 11. Miss Marie-Therese NOBLET, of Reims (31-8-1905) (11-2-1908). Dorso-lumbar Pott’s disease. 12. Fr. CIRETTE, of Evreux (31-8-1893) (11-2-1908). Antero-lateral spinal sclerosis. 13. Rosalie VILDIER (Sr. Sainte Beatrix) of Evreux (31-8-1904) (25-3-1908). Chronic Laryngo-bronchitis, probably of tuberculous origin. 14. Miss Joachim DEHANT, of Namur (13-9-1878) (27-4-1908). Ulcer of the leg with extensive gangrene. 15. Miss Aurelie HUPRELLE, of Beauvais (21-8-1895) (1-8-1908). Pulmonary tuberculosis. 16. Sr. SAINT-HILAIRE, of Rodez (20-8-1904) (10-5-1908). Intestinal carcinoma. 17. Miss Clementine TROUVE, of Paris (21-8-1891) (6-6-1908). Osteo-periostitis of the right foot. 18. Miss Marie LEBRANCHU, of Paris (20-8-1892) (6-6-1908). Pulmonary tuberculosis (spinster, mattress maker). 19. Miss Marie LEMARCHAND, of Paris (21-8-1892) (6-6-1908). Lupus of the face. (Spinster householder). 20. Miss Esther BRACHMANN, of Paris (21-8-1896) (6-6-1908). Tuberculous peritonitis. 21. Mrs. FRANCOIS, nee Rose Labreuvoies, of Paris (20-8-1899) (6-6-1908). Abscess of the right arm with gross fistula formation. 22. The Rev. Fr. SALVATOR, a Capuchin of Rennes (25-6-1900) (1-7-1908). Tuberculous peritonitis. 23. Mrs. Johanna DUBOS, married Bezenac, of Perigueux, (8-8-1904) (2-7-1908). Cachexia of unknown aetiology. Impetigo. 24. Pierre de RUDDER, of Bruges (7-4-1875) (25-7-1908). Open fracture of the leg. (Father, agricultural worker). 25. Sister MARIE DE LA PRESENTATION, of Cambrai (29-8-1892) (15-8-1903). Chronic gastro-enteritis. 26. Miss Marie SAVOYE (20-9-1901) (15-8-1908). Rheumatic mitral disease with failure. Gastro-enteritis. 27. Sister EUGENIA, of Evreux (21-8-1883) (30-8-1908). Peritonitis with septic phlebitis. 28. Anne JOURDAIN (Sister Josephine Marie) (21-8-1890) (10-10-1908). Spinal deformity: pulmonary tuberculosis. 29. Clementine MALOT, of Beauvais (21-8-1893) (10-10-1908). Pulmonary tuberculosis. 30. Cecile DOUVILLE DE FRANSSU (Sister Marie de Saint Jean de la Croix), of Versailles (21-9-1905) (8-12-1909). Tuberculous peritonitis. 31. Marie LUCAS, married Bire, of Lucon (5-8-1908) (30-7-1910). Incurable blindness with optic atrophy. 32. Aimee ALLOPE, of Angers (28- 5-1909) (5-10-1910). Cold tuberculous abscess with fistulae, tuberculous peritonitis. 33. Amelie CHAGNON, of Poitiers (21-8-1891) (8-9-1910). Osteo-arthritis, chronic osteitis tuberculosis of the knee involving bone and cartilage. 34. Antonia MOULIN, of Grenoble (10-8-1907) (6-11-1910). Suppurating wound of the right foot. 35. Marie BOREL, of Mende (21, 22-8-1907) (4-6-1911). Faecal fistulae of the lumbar region. 36. Aline BRUYERE (Sister Julienne), of Tulle. (1-9-1889) (24-3-1912). Cavitating pulmonary tuberculosis. 37. Elisa SEISSON, of Aix. (29-8-1892) (2-7-1912). Cardiac hyper-trophy with dependent oedema. 38. Marie FABRE, of Cahors (24-9-1911) (8-9-1912). Muco-membranous enteritis. 39. Virginie HAUDEBOURG, of Saint-Claude (17-5-1908) (25-11-1912). Tuberculous nephritis and cystitis. 40. Juliette ORION, of Lucon (22-7-1910) (8-10-1913). Pulmonary and meningeal tuberculosis. From 1913 until 1946 there were no Canonical judgements. 41. Francoise CAPITAINE (Sister Marie-Marghuerite), of Rennes (22-1-1937) (20-5-1946). Acute nephritis with generalized oedema. 42. Gabrielle CLAUZEL, of Oran (15-8-1943) (18-3-1948). Rheumatic spondylitis. 43. Rose MARTIN, of Nice (3-7-1947) (5-5-1919). Uterine carcinoma. 44. Francis PASCAL, of Aix (31-8-1938) (31-5-1949). Blindness and paralysis of the limbs. 45. Jeanne FRETEL, of Rennes. (8-10-1948) (20-11-1950). Peritoneal tuberculosis. 46. Marie-Therese CANIN, of Marseilles (9-10-1947) (6-6-1952). Pott’s disease with right sacrocoxalgia. 47. Louise JAMAIN, of Paris (30-3-1937) (8-12-1951). Pulmonary intestinal and peritoneal tuberculosis. (Spinster without profession). 48. Jeanne GESTAS, of Bordeaux (21-8-1947) (13-7-1952). Intestinal disorders with episodes of obstruction. 49. Col. Paul PELLEGRIN, of Toulon (3-10-1950) (8-12-1953). Right sided post operative fistula. (Retired officer, father). 50. Henriette BRESSOLES, of Nice (3-7-1924) (4-6-1957). Pott’s disease with paraplegia. 51. Evasis GANORA, of Casale (Italy) (2-6-1950) (31-5-1955). Hodgkin’s disease. Mason, father of five. 52. Traute FULDA, of Vienna (Austria) (12-8-1950) (18-5-1955). Addison’s disease. (Spinster, Ballet dancer). 53. Alice COUTEAULT, of Poitiers (16-5-1952) (16-7-1956). Multiple sclerosis. 54. Marie-Louise BIGOT, of Rennes (October 1953 and October 1954) (15-8-1956). Hemiplegia, deafness and total blindness. (Spinster, general maid). 55. Lydia BROSSE, of Saint-Raphael-Coutances. (September 1930) (1957). Multiple tuberculous fistulae. (Spinster, nurse). 56. Yvonne FOURNIER, of Limoges (1945) (1959). Sympathetic causalgia of the arm. (Spinster, medical secretary). 57. Madeleine CARINI, of San Remo (1948) (1960). Dorsal Pott’s disease with pulmonary and peritoneal tuberculosis. (Spinster). 58. Brother Leo SCHWAGER, of the Fribourg Benedictines (1952) (1961). Multiple sclerosis. (Benedictine). 59. Sister Marie MERCEDES (1951) (1961). Multiple sclerosis. 60. Ginette NOUVEL (1954) (1963). Budd-Chiari syndrome. 61. Juliette TAMBURINI, of Marseilles (1960) (1965). Osteo-periostitic fistula of the femur. 62. Elise ALOI, of Messina (1960) (1965). Osteo-articular tuberculosis with multiple infected fistulae. 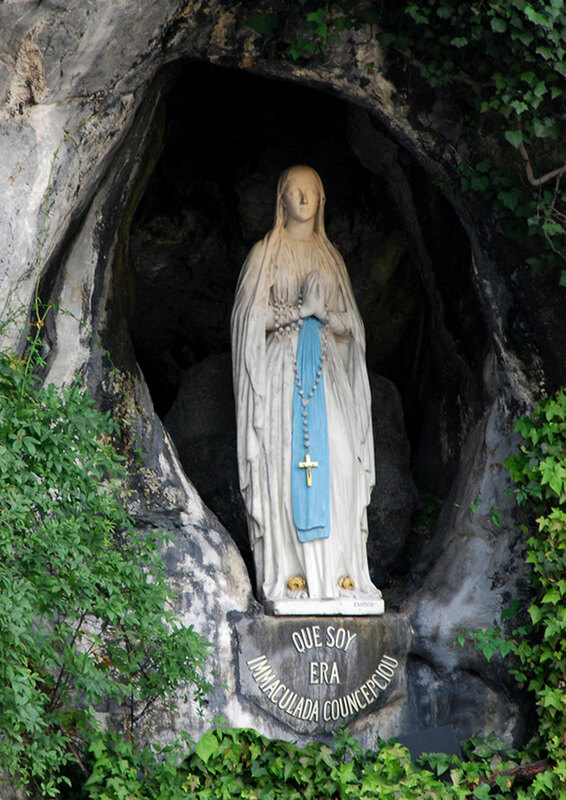 In 1858 in the grotto of Massabielle, near Lourdes, France, the Blessed Virgin Mary appeared 18 times to Bernadette Soubirous, a 14 year old peasant girl. She identified herself as The Immaculate Conception. She gave Bernadette a message for all: “Pray and do penance for the conversion of the world.” The Church investigated Bernadette’s claims for four years before approving devotion to Our Lady of Lourdes. Lourdes has since become one of the most famous shrines, attracting more than a million pilgrims each year. There have been thousands of miraculous cures at this shrine. A Medical Bureau was established in 1882 to test the authenticity of the cures. The doctors include unbelievers as well as believers and any doctor is welcome to take part in the examination of the alleged cures. As many as 500 medical men of all faiths or no faith have taken advantage of the invitation each year. Many books and movies tell the story of Lourdes. Even Hollywood made a movie of this remarkable event in the 1940′s entitled “The Song of Bernadette” which won six academy awards. No one leaves Lourdes without a gain in faith. Moral and spiritual cures are more marvelous than physical cures. Some go to Lourdes with lifetime prejudices, yet their minds are cleared in a sudden manner. Frequently skepticism gives way to faith; coldness and antagonism become whole hearted love of God. Again and again those who are not cured of bodily pain receive an increase of faith and resignation – true peace of soul. The story of two outstanding miracles that occurred at Lourdes are told below. The case of Gabriel Gargam is probably one of the best known of all the thousands of cures at Lourdes, partly because he was so well known at the Shrine for half a century, partly because it was a twofold healing, spiritual and physical. Born in 1870 of good Catholic parents, he gave early promise of being a clever student and a fervent Catholic. The promise was not fulfilled in the most important respect for, at 15 years of age, he had already lost his faith. He obtained a position in the postal service and was carrying out his duties as a sorter in December of 1899, when the train on which he was traveling from Bordeaux to Paris collided with another train, running at 50 miles per hour. Gargam was thrown fifty two feet from the train. He lay in the snow, badly injured and unconscious for seven hours. He was paralyzed from the waist down. He was barely alive when lifted onto a stretcher. Taken to a hospital, his existence for some time was a living death. After eight months he had wasted away to a mere skeleton, weighing but seventy-eight pounds, although normally a big man. His feet became gangrenous. He could take no solid food and was obliged to take nourishment by a tube. Only once in twenty-four hours could he be fed even that way. He brought suit for damages against the railroad. The Appellate Court confirmed the verdict of the former courts and granted him 6,000 francs annually, and besides, an indemnity of 60,000 francs. Gargam’s condition was pitiable in the extreme. He could not help himself even in the most trifling needs. Two trained nurses were needed day and night to assist him. That was Gabriel Gargam as he was after the accident, and as he would continue to be until death relieved him. About his desperate condition there could be no doubt. The railroad fought the case on every point. There was no room for deception or hearsay. Two courts attested to his condition, and the final payment of the railroad left the case a matter of record. Doctors testified that the man was a hopeless cripple for life, and their testimony was not disputed. Previous to the accident Gargam had not been to Church for fifteen years. His aunt, who was a nun of the Order of the Sacred Heart, begged him to go to Lourdes. He refused. 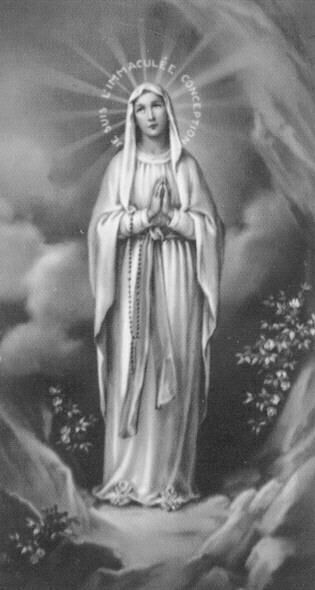 She continued her appeals to him to place himself in the hands of Our Lady of Lourdes. He was deaf to all her prayers. After continuous pleading of his mother he consented to go to Lourdes. It was now two years since the accident, and not for a moment had he left his bed all that time. He was carried on a stretcher to the train. The exertion caused him to faint, and for a full hour he was unconscious. They were on the point of abandoning the pilgrimage, as it looked as if he would die on the way, but the mother insisted, and the journey was made. Arrived at Lourdes, he went to confession and received Holy Communion. There was no change in his condition. Later he was carried to the miraculous pool and tenderly placed in its waters – no effect. Rather a bad effect resulted, for the exertion threw him into a swoon and he lay apparently dead. After a time, as he did not revive, they thought him dead. Sorrowfully they wheeled the carriage back to the hotel. On the way back they saw the procession of the Blessed Sacrament approaching. They stood aside to let it pass, having placed a cloth over the face of the man whom they supposed to be dead. A s the priest passed carrying the Sacred Host, he pronounced Benediction over the sorrowful group around the covered body. Soon there was a movement from under the covering. To the amazement of the bystanders, the body raised itself to a sitting posture. While the family were looking on dumbfounded and the spectators gazed in amazement, Gargam said in a full, strong voice that he wanted to get up. They thought that it was a delirium before death, and tried to soothe him, but he was not to be restrained. He got up and stood erect, walked a few paces and said that he was cured. The multitude looked in wonder, and then fell on their knees and thanked God for this new sign of His power at the Shrine of His Blessed Mother. As Gargam had on him only invalid’s clothes, he returned to the carriage and was wheeled back to the hotel. There he was soon dressed, and proceeded to walk about as if nothing had ever ailed him. For two years hardly any food had passed his lips but now he sat down to the table and ate a hearty meal. O n August 20th, 1901, sixty prominent doctors examined Gargam. Without stating the nature of the cure, they pronounced him entirely cured. Gargam, out of gratitude to God in the Holy Eucharist and His Blessed Mother, consecrated himself to the service of the invalids at Lourdes. He set up a small business and married a pious lady who aided him in his apostolate for the greater knowledge of Mary Immaculate. For over fifty years he returned annually to Lourdes and worked as a brancardier. The Golden Jubilee of his cure was the occasion of a remarkable celebration during the French National Pilgrimage in 1951. Mr. Gargam sat in a chair in the Rosary Square, surrounded by 1,500 sick and 50,000 other pilgrims while a description of his twofold healing was given by the celebrated apologist, Canon Belleney. His last visit to the Shrine was in August 1952: he died the following March, at the age of eighty-three years. In some respects the story of John Traynor is similar to that of Gabriel Gargam. Yet in many ways it is different. After their cures, the two men were brancardiers at Lourdes at the same time and may have discussed their cases with each other. John Traynor was a native of Liverpool, England. His Irish mother died when he was quite young, but the faith which she instilled in her son remained with him the rest of his life. His injuries dated from World War I, when he was a soldier in the Naval Brigade of the Royal British Marines. He took part in the unsuccessful Antwerp expedition of October, 1914, and was hit in the head by shrapnel. He remained unconscious for five weeks. Later, in Egypt, he received a bullet wound in the leg. In the Dardanelles, he distinguished himself in battle but was finally brought down when he was sprayed with machine gun bullets while taking part in a bayonet charge. He was wounded in the head and chest, and one bullet went through his upper right arm and lodged under his collarbone. As a result of these wounds, Traynor’s right arm was paralyzed and the muscles atrophied. His legs were partially paralyzed, and he was epileptic. Sometimes he had as many as three fits a day. By 1916, Traynor had undergone four operations in an attempt to connect the severed muscles of this right arm. All four operations ended in failure. By this time he had been discharged from the service. He was given a one hundred percent pension because he was completely and permanently disabled. He spent much time in various hospitals as an epileptic patient. In April, 1920, his skull was operated on in an attempt to remove some of the shrapnel. This operation did not help his epilepsy, and it left a hole about an inch wide in his skull. The pulsating of his brain could be seen through this hole. A silver plate was inserted in order to shield the brain. He lived on Grafton Street in Liverpool with his wife and children. He was utterly helpless. He had to be lifted from his bed to his wheelchair in the morning and back into bed at night. Arrangements had been made to have him admitted to the Mosley Hill Hospital for Incurables. In July, 1923, Traynor heard that the Liverpool diocese was organizing a pilgrimage to Lourdes. He had always had a great devotion to the Blessed Virgin and determined to join the pilgrimage. He took a gold sovereign which he had been saving for an emergency and used it as the first payment on a ticket. At first his wife was very much disturbed by the idea of her husband making such a difficult trip. His friends tried to talk him out of it. His doctor told him the trip would be suicide. The government ministry of pensions protested against the idea. One of the priests in charge of the pilgrimage begged him to cancel his booking. All of this was to no avail. Traynor had made up his mind, and there was no changing it. When his wife saw how much he wanted to make the trip, she decided to help him. In order to raise the money for the pilgrimage, the Traynors sold some of their furniture; Mrs. Traynor pawned some of her jewelry. There was much excitement at the railroad station the day the pilgrimage was to leave. In addition to the noise and confusion that accompanies the departure of every large pilgrimage, there was the additional hubbub caused by the curious who had come to see Traynor. His trip had aroused much interest, and at the station a great number of people crowded about his wheel chair. Newspaper reporters and photographers were on hand to cover the event. As a result of all this, Traynor reached the station platform too late to get on the first train. The second train was crowded, and once more an attempt was made to talk him out of taking the trip. Traynor, however, said that he was determined to go if he had to ride in the coal tender. The trip was extremely trying, and Traynor was very sick. Three times, during the journey across France, the directors of the pilgrimage wished to take him off the train and put him in a hospital. Each time there was no hospital where they stopped, and so they had to keep him on board. He was more dead than alive when he reached Lourdes on July 22 and was taken to the Asile. Two Protestant girls from Liverpool, who were serving as volunteer nurses in the Asile, recognized Traynor and offered to take care of him. He gladly accepted the offer. He had several hemorrhages during his six days there and a number of epileptic fits. So bad was his condition that one woman took it upon herself to write to his wife and tell her that there was no hope for him and that he would be buried in Lourdes. Traynor managed to bathe in the water from the grotto nine times, and he attended all the ceremonies to which the sick are taken. It was only by sheer force of will that he was able to do this. Not only were his own infirmities a serious obstacle but the brancardiers and others in attendance were reluctant to take him out for fear he would die on the way. Once he had an epileptic fit as he was going to the piscines. When he recovered, the brancardiers turned his chair to take him back to the Asile. He protested, but they insisted. They were forced to give in when he seized the wheel with his good hand and would not let the chair budge until it went in the direction of the baths. On the afternoon of July 25 when he was in the bath, his paralyzed legs became suddenly agitated. He tried to get to his feet, but the brancardiers prevented him. They dressed him, put him back in his wheel chair, and hurried him to Rosary Square for the Blessing of the Sick. Most of the other sick were already lined up. He was the third last on the outside as one faces the church. Let us hear in Traynor’s own words what happened after that. This is the story as he told it to Father Patrick O’Connor. “The procession came winding its way back, as usual, to the church and at the end walked the Archbishop of Rheims, carrying the Blessed Sacrament. He blessed the two ahead of me, came to me, made the Sign of the Cross with the monstrance and moved on to the next. He had just passed by, when I realized that a great change had taken place in me. My right arm, which had been dead since 1915, was violently agitated. I burst its bandages and blessed myself – for the first time in years. “I had no sudden pain that I can recall and certainly had no vision. I simply realized that something momentous had happened. I attempted to rise from my stretcher, but the brancardiers were watching me. I suppose I had a bad name for my obstinacy. They held me down, and a doctor or a nurse gave me a hypo. Apparently they thought that I was hysterical and about to create a scene. Immediately after the final Benediction, they rushed me back to the Asile. I told them that I could walk and proved it by taking seven steps. I was very tired and in pain. They put me back in bed and gave me another hypo after a while. “They had me in a small ward on the ground floor. As I was such a troublesome case, they stationedbrancardiers in relays to watch me and keep me from doing anything foolish. Late that night, they placed a brancardier on guard outside the door of the ward. There were two other sick men in the room, including one who was blind. “The effect of the hypos began to wear off during the night, but I had no full realization that I was cured. I was awake for most of the night. No lights were on. “The chimes of the big Basilica rang the hours and half hours as usual through the night, playing the air of the Lourdes Ave Maria. Early in the morning, I heard them ringing, and it seemed to me that I fell asleep at the beginning of the Ave. It could have been a matter of only a few seconds, but at the last stroke I opened my eyes and jumped out of bed. First, I knelt on the floor to finish the rosary I had been saying. Then I dashed for the door, pushed aside the two brancardiers and ran out into the passage and the open air. Previously, I had been watching the brancardiers and planning to evade them. I may say here that I had not walked since 1915, and my weight was down to 112 pounds. A strange feature of Traynor’s case was that he did not completely realize what had happened to him. He knew that a great favor had been bestowed upon him and that he should be thankful, but he had no idea of the magnitude of the favor. He was completely dazed. It did not seem strange to him that he was walking, and he could not figure out why everyone was staring at him. He did not remember how gravely ill he had been for many years. A cr owd of people gathered about Traynor while he was praying at the grotto. After about twenty minutes, he arose from his knees, surprised and rather annoyed by the audience he had attracted. The people fell back to allow him to pass. At the crowned statute of our Lady, he stopped and knelt again. His mother had taught him that he should always make some sacrifice when he wished to venerate the Virgin. He had no money to give. The few shillings he had left after buying a railroad ticket, he had spent to buy rosaries and medals for his wife and children. He therefore made the only sacrifice he could think of: he promised our Lady that he would give up cigarettes. The news of his cure had spread rapidly, and a great crowd was waiting at the Asile. Traynor could not understand what they were doing there. He went in and got dressed. Then he went into the washroom. A number of men were there ahead of him. “Good morning, gentlemen!” said Traynor cheerily. But there was no answer. The men just looked at him; they were too overcome to speak. Traynor was puzzled. Why was everyone acting so strangely this morning? “Yes, I can,” Traynor volunteered. The priest who knew nothing yet about the cure accepted the offer, and Traynor served Mass in the chapel of the Asile. It did not seem a bit out of the ordinary to be doing so. In the dining room of the Asile where Traynor went to eat his breakfast, the other patients stared at him in amazement. Later when he strolled outdoors, the crowd that had gathered there made a rush at him. Surprised and disconcerted he made a quick retreat into the enclosure. A Mr. Cunningham, who was also on the pilgrimage, came to talk to him. The visitor spoke casually, but it was evident that he was making a great effort to control his excitement. “They’re there, Jack, because they are glad to see you. Mr. Cunningham told him that one of the priests of the pilgrimage – the one who had opposed his coming – wished to see him. There was much difficulty getting through the crowd, but they finally got to the hotel where the priest was waiting. The priest asked him if he was all right. All this solicitude was most bewildering. The priest broke down and began to cry. Traynor traveled home in a first-class compartment despite all his protests. As they were going across France, Archbishop Keating of Liverpool came into his compartment. Traynor knelt to receive his blessing. The Archbishop bade him rise. “John, I think I should be getting your blessing,” he said. Traynor did not know what the Archbishop meant. Someone suggested to Traynor that he telegraph his wife. Instead of telling her that he had been completely cured he merely said, “Am better – Jack.” His wife was very much pleased to receive this message. She had been very much upset when the woman in the pilgrimage had told her that he was dying. But she was not prepared for the glorious news that was to come! She was the only one who was not, for the story had been in the Liverpool papers. Since she had not happened to see the story, those about her decided not to tell her. They thought it would be nicer to surprise her. It seemed that all Liverpool was at the station to greet the cured man upon his return. When Mrs. Traynor reached the platform, she told who she was and asked to be allowed through the crowd. In an attempt to save Traynor from being crushed by the crowd which was growing every minute, the railway company stopped the train before it got to the station. The Archbishop walked toward the crowd. He asked the people to restrain their enthusiasm when they saw Traynor and to disperse peacefully after they had had a look at him. They promised that they would do so. Despite this promise there was a stampede when Traynor appeared on the platform. The police had to clear a passage for him to pass through. The joy of Traynor’s family upon his return and their deep gratitude to Our Lady of Lourdes could never be put into words. The cured man went into the coal and hauling business and had no trouble lifting 200-pound sacks of coal. He went back to Lourdes every summer to act as a brancardier. He died on the eve of the Feast of the Immaculate Conception in 1943. The cause of his death was in no way related to the wounds which had been cured at Lourdes. The two non-Catholic girls who looked after Traynor at Lourdes came into the Church as a result of the cure. Their family followed their example, and so did the Anglican minister of the church they had been attending. A great number of conversions in Liverpool resulted from the miracle. Although the cure took place in 1923, the Medical Bureau waited till 1926 to issue its report. Traynor was examined again, and it was found that his cure was permanent. “His right arm which was like a skeleton has recovered all its muscles. The hole near his temple has completely disappeared. He had a certificate from Dr. McConnell of Liverpool attesting that he had not had an epileptic attack since 1923. . . .
As is usual in such cures, John Traynor retained souvenirs of his former afflictions. The right hand did not hang quite normally, and the right forearm was a little less thick than the left. A slight depression was the only trace that was left of the hole in the skull. If John Traynor and Gabriel Gargam ever discussed their cases and compared notes while both were serving as brancardiers, they must have been amused by one point. Gargam succeeded in having his pension from the railway company discontinued. The British War Pension Ministry, however, insisted upon paying Traynor’s pension till the end of his life. They had examined him thoroughly and found him incurable. They did not care what the Lourdes Medical Bureau said or what any of the doctors who examined Traynor after his return from Lourdes reported. It did not matter that he was engaged in the most strenuous kind of work. They had pronounced him incurable, and incurable he was. This decision was never revoked.